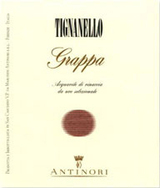 Grappa Tignanello is obtained from the distillation of the marc from the Sangiovese and Cabernet grapes growing in the Tignanello vineyard which is situated on the Antinori estate 'Tignanello' in the heart of Chianti Classico. As soon as the marc has fermented, it is drawn off from the tanks and pressed, and immediately taken to the distillery. This procedure guarantees that distillation is carried out using the best quality marc possible - rich is alcohol and more importantly with good aromatic characteristics.